Australia is a great place to see from the back of a motorcycle. 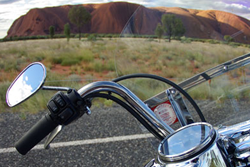 With its superb weather, clear air and stunning landscapes, Australia is an ideal destination for motorcycle touring. You can experience a short Australian motorcycle tour for an hour, half day or full day, taking in the sights. Self guided motorcycle tours often include the bike, great accommodation and an itinerary crammed with information about the route, distances, things to see on the way and other interesting background information. Alternatively you can experience a guided Australian motorcycle tour, meet great people, have expert support and see parts of Australia most travellers could only ever dream of. There is no better way to see iconic Ayer’s Rock. In fact, with such wide open spaces and so few people around, motorcycle touring in Australia is a brilliant way view certain parts this vast country. Central West: Experience the exhilaration of cruising the open roads of the Central West Region in style on the back of one of the worlds greatest road bikes. Sydney: G’DAY and welcome to Australia’s premier motorcycle rental and tours company. Here at Bikescape we have a passion for riding motorcycles. Cape York: Cape York Motorcycle Adventures is a privately owned company operating in the relatively new market of motorcycle adventures in Cape York. Sunshine Coast: Freedom Wheels offers rides and tours on Harley-Davidson motorcycles in Queensland, Australia’s premier vacation state. Cairns: Motorcycle off road tours are based in Cairns. They offer one, two and eight day tours to Cape York and also Simpson Desert safaris.